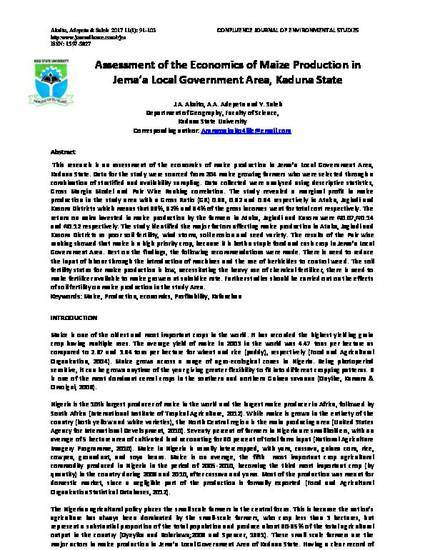 This research is an assessment of the economics of maize production in Jema’a Local Government Area, Kaduna State. Data for the study were sourced from 204 maize growing farmers who were selected through a combination of stratified and availability sampling. Data collected were analysed using descriptive statistics, Gross Margin Model and Pair Wise Ranking correlation. The study revealed a marginal profit in maize production in the study area with a Gross Ratio (GR) 0.98, 0.92 and 0.94 respectively in Atuku, Jagindi and Kusom Districts which means that 98%, 92% and 94% of the gross incomes went for total cost respectively. The return on naira invested in maize production by the farmers in Atuku, Jagindi and Kusom were ₦0.07,₦0.14 and ₦0.12 respectively. The study identified the major factors affecting maize production in Atuku, Jagindi and Kusom Districts as poor soil fertility, wind storm, soil erosion and seed variety. The results of the Pair wise ranking showed that maize is a high priority crop, because it is both a staple food and cash crop in Jema’a Local Government Area. Best on the findings, the following recommendations were made. There is need to reduce the input of labour through the introduction of machines and the use of herbicides to control weed. The soil fertility status for maize production is low, necessitating the heavy use of chemical fertilizer, there is need to make fertilizer available to maize growers at subsidize rate. Further studies should be carried out on the effects of soil fertility on maize production in the study Area.